When it first became apparent that I would need to go and stay with my dad for a while until he recovered from his bad back, I figured it would probably be quite a short term thing and I probably wouldn't need to bring a lot of stuff. Consequently, I only packed a few sleep over essentials for my hair. However, because I'm so used to being surrounded by my hoards of hair products, tools and accessories, it took me a minute to whittle it down to what I consider to be my basic essentials or a sleep over kit. Because it's easy! Even if I cant be bothered to tie a headscarf at night, I have no excuses for not simply slipping this on instead. Because I try not to use brushes too often anyway, and between this comb and my fingers, I have all I need for basic partings and detangling. Because almost anything is possible with hair pins! Before I do any sort of styling or detangling of my hair I always add some form of moisture!!! This is my must have spritz for my hair and luckily its available in travel size bottles. In case my ends need sealing or my hair just needs something thicker than a leave-in, its good to have a small tub of butter with me. I've mixed my shea butter with some coconut oil and castor oil. It's also useful as a body butter too. I love this oil for my scalp but especially at this time of year when my scalp tends to need the most care. This is the product that helps me fight the flakes. I really wish I could get this in a miniature bottle too. 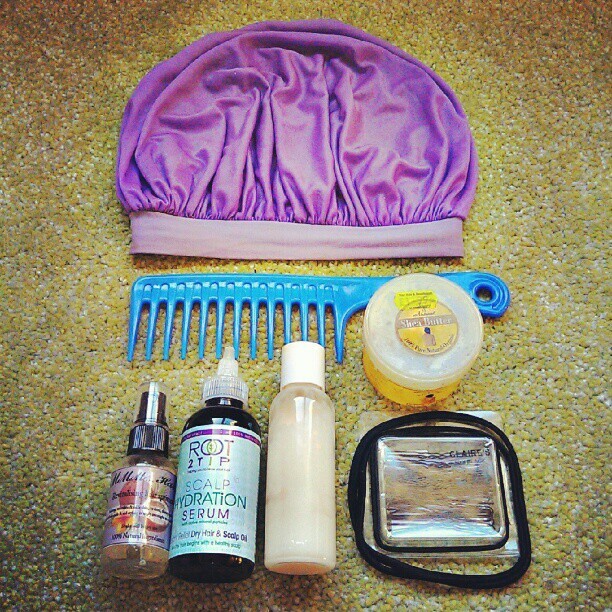 What would you take in your natural hair sleep over kit? I use the sama scalp hydration serum. It's one of my must have products.